We do not sell alcohol but we will happily serve that special bottle of wine you bring with you. Read about us in The New York Times and Philly Magazine. 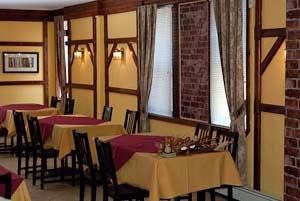 We offer delicious Polish and American cuisine at a price you can afford in a cozy and friendly atmosphere. Choose from a selection of hand-picked variety of Polish food specialties including pierogi, stuffed cabbage, borscht and other all-time favorites. We are open for lunch and dinner daily except Mondays and Tuesdays. On weekends please check our calendar to confirm availability. Lunch? We do appreciate that lunch time is limited and we will make every effort to serve you fresh, delicious food within 15 minutes. In a hurry? Do not feel like cooking tonight? Stop by to pick up a dinner for one or for the whole family. Call in advance to have it waiting for you when you come. Planning a party? Call us! We will be happy to reserve the restaurant for up to 35 people or just the private room for up to 8 people. Choose from predefined menus or customize the menu to your liking. Major credit cards are welcomed.